Gorgeous late-season color on easy-to-grow vine. Skyblue flowers add a splash of color to trellises and fences. Quick-growing vine has heart-shaped leaves and can be used as a ground cover. Grows 6-12 ft. tall. Full sun. Approx. 50 seeds per pkt. Zones 3-9. For each offer ordered, get 50 seeds per pkt. Color: Sky blue flowers with a white throat. 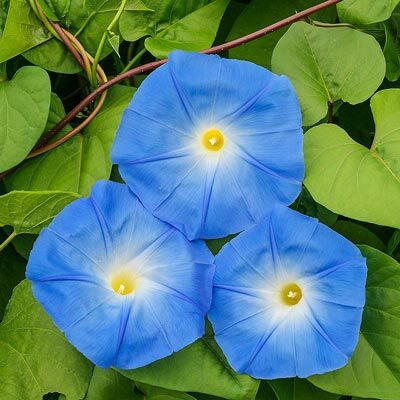 Flower Form: Typical morning glory flowers. Soil Requirements: Light, well-drained soil.